Oh. This will be quick. I need some time to sit down and type up and insert images into a 20in24 race report. I have 2 posts that will be, well, posted if life cooperates. What's that? You want the abridged version? I ran 42 miles. Took a nap. Ran 42 miles. Go on with your lives. My neighbor has been running for 30+ years. He had not be able to squeeze in a run for the past few months because of a busy life. I know what you're thinking. But it's true. Sometimes, you're making so many other sacrifices, that the additional sacrifice (time, mostly) needed for the run, just isn't fair. I saw him at the neighborhood pool yesterday. This is after I've bugged him 30 times already this summer about whether he's gotten out for a run (he's going crazy from runner's withdrawal). Neighbor: "I might go out for a run tomorrow." He's out walking his dogs about 15 minutes later. I run up to him. Me: "I'll meet you at the end of your street." Neighbor: "Thanks Mike. Thank You." Got him out the door. You don't want to stand up a running date! Months off of running, solved with a little push. 3 miles to start the day. His next planned run? In 2 days. 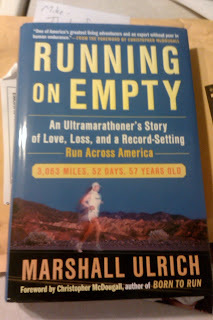 It was sent to me by a fellow Lone Ranger ultramarathoner from the 20in24. We crossed paths about 19 hours into the race. He took advantage of my fresh legs (only about 65 miles deep) to help pace him for the remainder of the race. Towards his finish at 118 miles! In our delirium, he suggested he'd send me that book. He told me I'd love it. And I'd NEED to watch the movie, too. And today, 3 days after the race, it was in my mailbox. Now go spread some running karma! Running Karma is not my friend right now. Kleenex on the other hand is my new best friend. I am sadly starting to relate to your friend's withdrawal, and it's only been two days. What a good friend you are though. The only time running gets me out the door that early is when I have a race. You are killing me with the one line abridged version. Ready for the two parter! You are my hero, and I don't even know the details yet. Yes, sometimes you need that extra push to get out. I did the same thing (well, not at 4:30 a.m.) with a friend who has been trying to get into shape. Dragged her to the gym...Now she has a membership - long story behind that one. Nothing like a partner to get you going. Congrats on your finish. It sure took you a long time to let us know; I was checking constantly earlier in the week. Can't wait for the report. Enjoy the book. It's caught my eye several times.